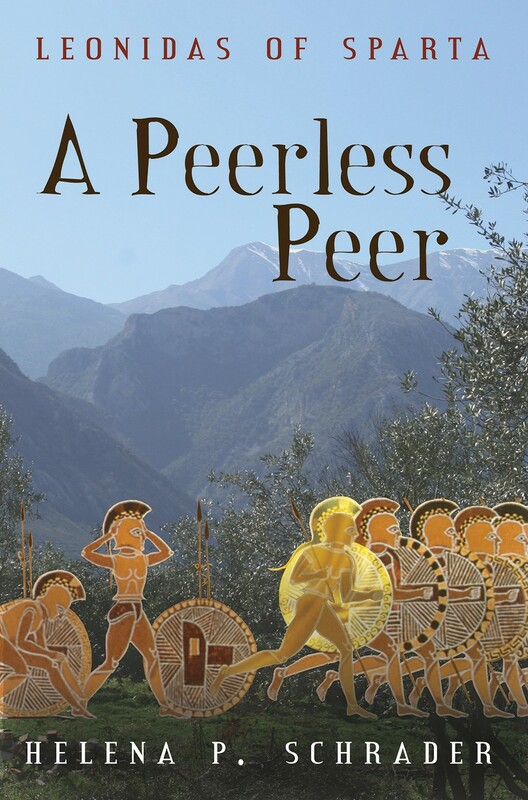 Military Appointments: An Excerpt from "A Peerless Peer"
Last entry talked about the various ways in which Spartan officers may have been elected/appointed. In this excerpt I describe a concrete case of a lochogos (divisional commander) selecting his deputy with an eye toward influencing the already mad Agiad king Cleomenes. Kyranios' head was was killing him. He felt as if one of the Titans had clamped his hand around his skull and as pressing inward. Kyranios could picture the plates of his skull fracturing like an egg pinched between the Titan's thumb and forefinger. He put his fingertips to his temples and tried to rub the pain away. Kyranios did not believe the authenticity of the oracle Cleomens claimed to have received from Delphi. He as not alone in his doubts. King Demaratus had openly scoffed at it, asking Cleomenes what it had cost him. This, however, had only led to a violent verbal exchange between the two kings that had demeaned and discredited them both. Leotychidas, however, sensing a new opportunity to discredit Demaratus, had done all he could to ensure a majority in favor of war when the proposal came to the vote in the Assembly. A knocking on the door made Kyranios lift his head, drop his hands, and square his shoulders firmly. "Come in!" he barked, while his quartermaster and clerk looked briefly over their shoulders toward the door. Leonidas entered, his helmet in the crook of his elbow, his leather corselet gleaming with oil, and his chiton fresh and clean -- as was proper when a junior officer reported to his superior. "You sent for me, sir?" Kyranios nodded and signaled Leonidas to come forward, but did not stand. He was afraid that getting to his feet would make him dizzy and that Leonidas might notice he was off balance. "I have bad news for you," he announced, watching Leonidas' expression. Leonidas, he calculated, was thirty-five -- exactly the age he'd been when he'd taken over the lochos. Leonidas admittedly had less experience as a company commander -- just three years -- but he had handled his company, and before that his task force during the expedition with the Corinthian grain fleet, splendidly. And Leonidas was an Agiad. Kyranios felt he had to take a chance on him. Kyranios drew a deep breath. "You aren't going to like this," he told Leonidas bluntly, "but I have decided to appoint you my deputy; my current deputy will take over your pentekostus." Leonidas started visibly and then asked simply, "Why?" "I need you. That will have to be reason enough for you. Now, as my deputy, come with me to the Agiad Palace." Kyranios pushed his chair back and dragged himself to his feet, closing his eyes briefly a the room spun around him. When he opened his eyes again, Leonidas was holding out to him the white-crested helmet denoting his rank as lochagos and watching him keenly, but he said nothing. They walked in silence down the long corridor and out onto the porch of the lochogos headquarters. Kyranios kept waiting for Leonidas to say something. He knew Leonidas enjoyed command -- just as he had. He was sure he did not want the position of deputy, which was a position without direct command authority, a position more like an advisor. [The five lochagoi and their deputies] left the palace and dispersed in the direction of their respective headquarters. Kyranios and Leonidas again walked side-by-side in silence, until Kyranios asked, "You understand what needs to be done, don't you?" "You want me to keep my brother in check." "I'm not sure it will work. He doesn't respect my opinion -- as you saw this afternoon." "What I saw was that you made him stop and think for a very long time. That's a good start. Not many men can do even that anymore." 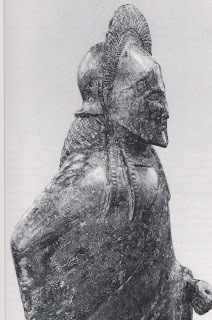 Given the importance of the Spartan army in Spartan society and history it is surprising how little is known about the selection of officers. Stephen Hodkinson, in “Social Order and the Conflict of Values in Classical Sparta" (Whitby, Michael. Sparta. Routledge, 2002, pp. 104-130.) rightly stresses the fact that patronage and family background appears to have been at least as important as outstanding ability and success. However, he fails to put his discussion in context or to provide key information about the promotion of junior and mid-level officers. The relevant question is how did Sparta’s system of promotion and appointment to command compare to the systems used by contemporary societies? Weren’t Persia’s armies commanded by her kings and noblemen? Even in democratic Athens, it was only those wealthy enough to finance ship-building, who commanded triremes. Furthermore, even the nominally elected generals were all from the so-called “better families.” Can anyone explain to me why no one appears to think Athens less democratic just because the opulently wealthy Miltiades or Alkibiades were also commanders, but the presence of wealth in Sparta or the appointment of commanders with connections to the royal families is treated as scandalous, dangerous and offensive? It would also be useful to remember that even in today’s modern Western societies promotion to senior positions whether in the army, politics or business is not a matter of pure objective advancement by merit. As they saying goes, “it’s not what you know, but who you know.” The Germans speak of the importance of “Vitamin B” for Beziehungen (contacts). Americans talk of “networking” and “mentoring.” Why should we attach so much approbation to Spartans seeking to capitalize on relationships when we do it ourselves? Turning to the issue of promotion in the lower ranks, I believe this topic deserves a great deal more attention because promotion to these ranks was probably an essential prerequisite to promotion to higher ranks. To my knowledge, however, no one has attempted to explain how it occurred, which has led me to speculate on possible procedures. For example, boys in the agoge elected their herd leader so it is not completely unimaginable that they elected their enomotarch. Since an enomotia was a relatively small, close-knit unit similar in many ways to a herd of boys in the agoge, such an arrangement might even have helped solidify cohesion and discipline. The same, however, cannot be said for the election of pentekonteres and lochagoi. In these larger units, it would have been difficult for all members to know the qualities of the others and far more difficult to find consensus. Elections and competition for the position of commander would, therefore, have undermined discipline rather than reinforced it. Nevertheless, it is possible that a modified election procedure was used for these more senior ranks in which only the enomotarchs elected the pentekonteres and only the later elected the lochgoi. Yet, while the election of officers is not inconceivable, in the absence of positive evidence to support it, the thesis seems a bit radical. After all, the hippeis were appointed by the hippagretai, who first had been appointed by the ephors. This suggests a top-down approach more consistent with military experience the world-over up to the present time. Assuming that officers were appointed rather than elected, we are left with the issue of who did the appointing. The kings, of course, took precedence in war and commanded Sparta’s armies, but they were often at loggerheads with one another and for all their vaunted influence, there is to my knowledge no evidence that they could simply appoint officers. Furthermore, as noted above, the ephors appointed the hippagreta, and as Hodkinson outlines they also played a role in extraordinary appointments such as nauarchos, harmosts and polemarchs. It would appear that at some level the promotion system entailed a formal process involving the ephors. Yet especially for these more senior posts, it is hardly likely that the ephors acted on their own. The ephors were essentially executives, operating -- except under exceptional circumstances -- on the guidance given by the Gerousia and/or Assembly. The involvement of the Assembly in the promotions of nauarchos, harmosts and polemarchs is particularly plausible. The Assembly was involved in the declaration of war or peace. It could demand the exile or recall even the kings themselves. It does not seem a stretch to picture the Spartan Assembly at least approving senior appointments or selecting a candidate among a short-list presented by the Gerousia/ephors (as Hodkinson suggests for harmosts and nauarchos) for polemarchs and lochagoi as well. But how practicable would it have been to put forward to the Assembly the names of each candidate for an enomotai? I think this unlikely. Nor does it seem likely that the Gerousia was the body responsible for appointing junior and mid-level officers. By definition it was composed primarily of old men and their familiarity with the age-cohorts suitable for more junior levels of command would have been limited. Given the example of the hippagretai, I think it most likely that polemarchs and lochagoi were selected by a combination of Gerousia/ephors making a recommendation that then had to be ratified by the Assembly similar to the procedure used for nauarchos and harmosts, but that they then appointed their pentekoneres, who in turn appointed the enomotarchs. I would suggest further that given the professionalism of the Spartan army and organization of the entire society along age lines, that only men with a set amount of experience would be eligible for each rank. It would be most logical, as in other military organizations over the centuries, that advancement to a senior rank was only possible after serving in the next lower rank. Thus no man could be a pentekontes without first being an enomotarch, and no one could become a lochagos without first serving as a pentekontes. If this is hypothesized, then the number of men eligible for senior positions would be reduced to a number that would be manageable – the short list that the Gerousia/ephors would present to the Assembly for a final vote. It would also mean that promotion depended heavily on winning the favor of those above you in the chain of command -- a system that can be stifling to the advancement of outsiders, individualists and radical thinkers! While this procedure seems logical and appears consistent with what we do know, I admit it is almost pure speculation. I’d appreciate your comments on this thesis. Promotion in the Spartan army plays a role in my novel "A Peerless Peer."